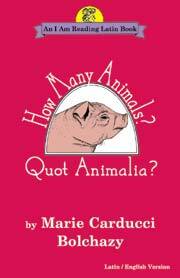 Bolchazy-Carducci: How Many Animals? : Quot Animalia? Aided by original artwork and an English translation, children learn the Latin words and Roman numerals for numbers 1-12 and 100. They also learn the Latin words for a variety of animals, together with English derivatives. The original artwork is charming and creative. A complete vocabulary and pronunciation guide are provided; a recording of the text is also available. This is the best of the four books in the "I am Reading Latin" series published by Bolchazy-Carducci. The reader is introduced to the names of thirteen different animals, numbers from 1-12 and 100 (both in Roman numerals and written out in Latin). This is all done in an early-reader type format with simple, realistic line drawings and large, easy-to-read words. This would be a great book for young children (approximately 4-8 years old) whose older siblings are studying Latin - particularly in a homeschool setting where they are exposed to some of the lessons and may overhear (and be curious about) some of the words. The back of the book includes complete translations of the Latin text (although these are fairly simple to surmise from the pictures), a pronunciation guide, glossary and other notes. "How many animals?" is the first of two books written for children aged 4-8. I thought I would test the reaction from a Reception class (4-5) and year 1 (5-6) before writing my review. The pictures are monochrome but large and easily reconisable. The text is also large, so good readers can say the word. The main objective of the book is for the Latin words to be heard, along with their meanings. Children soon remembered porcus and elephantus and enjoyed repeating them; they loved plurals (porci, elephanti) and even managed to guess that lupus and cuniculus became lupi and cuniculi before they were shown the book! The next part introduces numbers 1 to 12 and 100, using these with animals; e.g. unus porcus, novem ursi. These classes learn numbers in French so were excited to do the same in Latin. This led to a game in which children were grouped into twos or threes or sevens and responded duo, tres, or septem. Finally, I divided the children into animalia or numeri, giving each pupil a Latin word to remember. They had to listen for their word, and then stand up and repeat it; the others said its meaning. They became admirably quick and accurate in this activity! The book introduces a little easy Latin for children to hear, repeat, and understand, without overstretching them. It ends with adjectives (e.g. unus ursus ferus) whose meaning children can depict using actions.